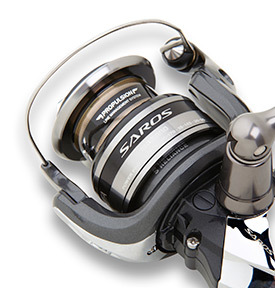 Sahara: Shimano introduces an upgrade to its Sahara front-drag spinning reels. Now with Varispeed II oscillation and Shimanos M Compact Body, the new Sahara series line-up includes the SH-1000FE, 2500FE, 3000FE and 4000FE. Our Sahara reels are all about versatility for all types of freshwater and saltwater fishing situations, said Ken Iida with Shimanos product development staff. Anglers have sizesand new featuresto chase after panfish, crappies, bass, walleyes and catfish, plus theres the power and line capacity on the cold-forged aluminum spool with the larger sizes to tackle the salt. Anglers will notice the new Sahara FE reels have a smaller profile from Shimanos M Compact Body design concept. Each reel has small curving details to increase rigidity and reinforce the entire XT-7 material body and keep all the internal moving parts in alignment. While all the reels are smaller, line capacity remains the same on their cold-forged aluminum spools. 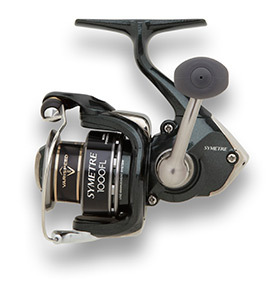 For better casting performance, the Sahara FE reels feature Shimanos new VariSpeed II oscillation system. It oscillates in two variable speeds to lay the line flatter onto the spool, providing trouble-free and longer distant casts. Saros: Solid feel from new proprietary material, and the ability to easily adjust the drag while fighting a fish are two of the key features behind Shimanos redesigned Saros FA spinning reels. The series brings a complete upgrade to all four sizes available1000FA, 2500FA, 3000FA, 4000FAwith a long list of Shimano reel technology to battle anything from trout and panfish, to bass, walleye, stripers, redfish, snook, bonefish and more.According to Ken Iida with Shimanos product development team, XGT7 provides superior strength and durability, plus an exceptionally solid feel. We then combine that construction with our X-Ship technology with its double bearing supported pinion gear for solid cranking power. Anglers will experience increased gearing efficiency and power, providing for ultra-light handle rotation and a smooth, effortless retrieve. And when you are hooked-up, anglers have the convenienceand reliabilityof Shimanos Rapid Fire Drag. While it provide for easy and accurate drag adjustments when fighting a fish, Iida notes, Rapid Fire Drag really comes into play when you realize that shore lunch size walleye you hooked has turned into one that could go double-digits. Symetre: For nearly 20 years, anglers have been using Shimano Symetre spinning reels for all kinds of freshwater fishing action and even some inshore saltwater fun. And as it has done over those years, Shimano brings out another new series of Symetre front-drag reels with upgraded featuresthe new models include the SY-1000FL, 2500FL, 3000FL and 4000FL.From whats inside the reels, anglers will feel exceptional smoothness during the retrieve from Shimanos X-Ship technology. By supporting the pinion gear with bearings, were able to increase gearing efficiency and power, providing for ultra-light handle rotation, said Ken Iida with Shimanos product development team. Were able to virtually eliminate pinion gear twist and rotor flex when youre fighting a nice fish, plus youll be able to rely on out-of-the-box smoothness for the life of the reel. On the outside, the new Symetre FL reels have a smaller profile from Shimanos new M Compact Body design. Each reel has small curving details to increase rigidity and reinforce the entire XT-7 material body and keep all the internal moving parts in alignment. While all the reels are smaller, line capacity remains the some on their cold-forged aluminum spools. For better casting performance, the Symetre FL reels feature Shimanos new VariSpeed II oscillation system. It oscillates in two variable speeds to lay the line flatter onto the spool.